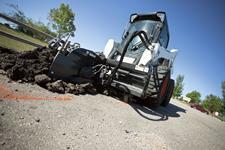 The Bobcat® planer attachment operator training course imparts rules and practices for safe operation. It is NOT designed to license or certify operators as skilled or factory authorized operators. View an excerpt of the planer attachment operator training handbook. Get a preview of the video content in the planer attachment operator training course. The importance of properly attaching and removing the planer from the loader. The planer's components and safety features. The importance of daily planer inspections and periodic maintenance. How to assess a job site before milling. How to get on and off the loader and planer safely. The fundamentals of safely maneuvering and operating a planer. The proper methods for transporting a loader. Various types of milling applications an operator might encounter.